For some people, their lawn is a source of pride, and for others, caring for their lawn is a chore. Yet for an increasing number of people, turf care is a cause of ecological anxiety. 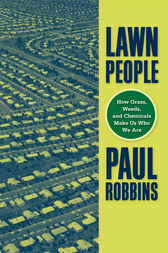 In Lawn People, author Paul Robbins, asks, "How did the needs of the grass come to be my own?" In his goal to get a clearer picture of why people and grasses do what they do, Robbins interviews homeowners about their lawns, and uses national surveys, analysis from aerial photographs, and economic data to determine what people really feel about-and how they treat-their lawns. Lawn People places the lawn in its ecological, economic, and social context. Robbins considers the attention we pay our turfgrass-the chemicals we use to grow lawns, the hazards of turf care to our urban ecology, and its potential impact on water quality and household health. He also shows how the ecology of cities creates certain kinds of citizens, deftly contrasting man's control of the lawn with the lawn's control of man. Lawn People provides an intriguing examination of nature's influence on landscape management and on the ecosystem. Paul Robbins is Associate Professor in the Department of Geography and Regional Development at the University of Arizona. He is the author of Political Ecology: A Critical Introduction.